Combining elements of the occult, magic, metaphysics, and paganism, Wicca encompasses a wide body of beliefs, generally summed up in the Wiccan Rede - An it harm none, do what ye will. 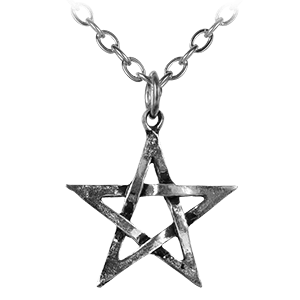 Here we carry a variety of Wiccan jewelry including Wicca necklaces, Wicca pendants, Wicca earrings, Wicca rings, and other Wicca accessories. Many of these pieces feature common Wiccan motifs and symbols including pentagrams, moons, the Sabbats, heptagrams, pagan gods and goddesses, ravens, chalices, athames, and more. Whether you follow Wicca or simply appreciate the intricacy of these designs, you will be sure to find many pieces to enjoy here! Decorated with the elegant symbols and motifs of Wicca, we carry a selection of Wiccan bracelets that will add unique and meaningful beauty to any look. 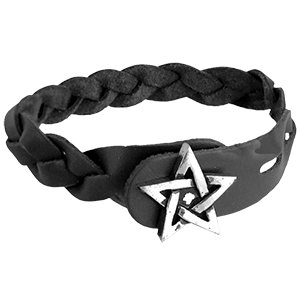 Check out our intricately detailed, sterling silver pentacle bangle bracelets, triple moon wrist cuffs, leather pentagram wristbands, raven pentacle accessories, and more to help celebrate and show your belief. Our Wiccan wristwear is easy to wear and works for any occasion, from formal to everyday, and is sure to make a statement however you wear it. Crafted from high quality materials like sterling silver, and with intricate detail throughout, our Wiccan brooches are phenomenal accents to any outfit. We offer a selection of Wiccan brooches and pins featuring iconic symbols like crescent moons, triskelia, pentagrams, and imagery of the eight Pagan sabbaths forming the Wheel of the Year. Easy to wear, these Wiccan brooches are impressive accessories and look great pinned to a lapel or scarf. These remarkable Wiccan jewelry pieces are beautiful ways to show your faith or your appreciation for the beauty of Wiccan iconography at special events or as part of your everyday fashion. 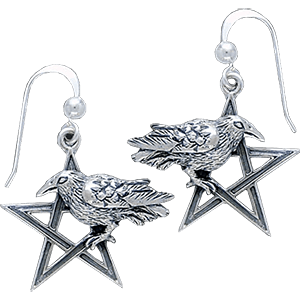 Wicca makes use of many striking motifs and symbols, as seen in the designs of the Wiccan earrings offered here. We carry Wiccan hook earrings and Wiccan stud earrings featuring crescent moons, pentagrams, ravens, the triple goddess, and heptagrams. Additionally, we offer a series of dangle earrings featuring wedge-shaped earrings that celebrate each of the eight Sabbats - Yule, Imbolc, Ostara, Beltane, Litha, Lughnasadh, Mabon, and Samhain. Most of our earring designs require pierced ears to wear. Peruse our Wicca earring section to find the perfect pair to accompany one of our Wiccan necklaces or pendants for a stunning look! Wicca embraces eye-catching motifs and symbols, including the pentagram or pentacle, the triple goddess, crescent moons, pagan gods and goddesses, ravens, heptagrams, ritual tools like athames and chalices, and many others. Here we carry a variety of Wiccan necklaces that make use of these striking elements in their stylish designs. All of the pagan necklaces and pendants in this section come with a chain or cord of some kind in order to make each piece an easy addition to any outfit. Whether you follow the tenets of Wicca or simply appreciate the appearance of these pieces, you can be sure to find an amazing accessory for your look here. 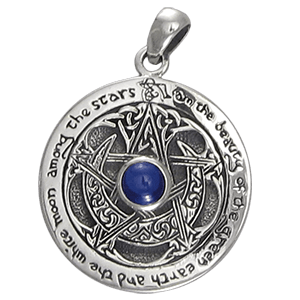 Whether you follow the tenets of Wicca or are simply fascinated by the unique mix of styles apparent in Wiccan motifs and symbolism, you can appreciate the eye-catching Wiccan pendants available here. We offer an assortment of Wiccan amulets, pagan pendants, pendulum pendants, and Wiccan lockets that create striking accessories when combined with the chain or cord of your choice, sold separately. 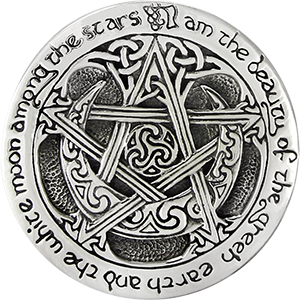 Many of the occult pendant designs feature pentagrams and pentacles, crescent moons, the triple goddess, pagan deities, ravens, and other icons. Several of our pieces also draw upon the Wheel of the Year and the Sabbats for inspiration in their design. Take a moment to browse, and you will be sure to find something of interest! Here we carry a wide assortment of Wiccan jewelry, such as these Wiccan rings, in many eye-catching styles. 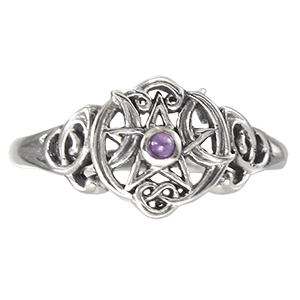 Our pagan ring designs use a number of popular Wiccan motifs, including pentagrams, the Seal of Solomon, serpents, ravens, crescent moons, the triple goddess, broomsticks, heptagrams, and many more. We also offer a handful of unique Wiccan ring designs like poison rings and signet rings. Many of these pieces are available in sizes suitable for men and women, and certain ones allow you to pick your choice of gemstone. No matter whether you follow Wiccan beliefs or simply enjoy striking jewelry, you can find stylish pieces for your outfit here in this section! When you are looking for a unique way to accent your appearance with the eye-catching emblems of Wicca, look no further than our selection of Wiccan hair accessories. 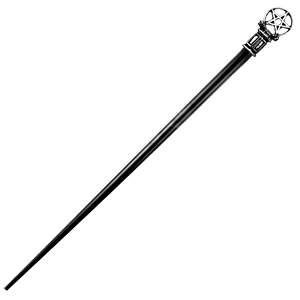 We carry a varied selection of Wiccan hair accessories here, ranging from pentacle-topped hair sticks and Wiccan hair slides to pentagram and triple moon and triple goddess headbands. Whether you are looking for a unique way to wear your hair up or an accent like a hengeband to simply place over the head like a band or circlet, shop here for everything you need to add a touch of Wicca symbolism to your everyday or special occasion hairstyle. Thanks so much for your help and excellent service!